As you can guess from the title, this post will be focusing on my birth story experience. 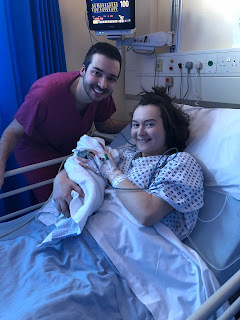 I think it's important to be able to share birth story experiences, and also I just love reading other people's so I certainly hope you enjoy reading mine! Like the subheading suggests, I chose to have surgery to birth Edith. Why? Anxiety. I didn't actually have a medical reason to satisfy the criteria to have a caesarean, so I did end up asking specialist doctors for one, because the thought of a vaginal delivery absolutely terrified me. Let me put this into context, I have miscarried twice. The thought of losing a baby during labour ,resounded in the back of my mind, and was scaring me beyond belief. 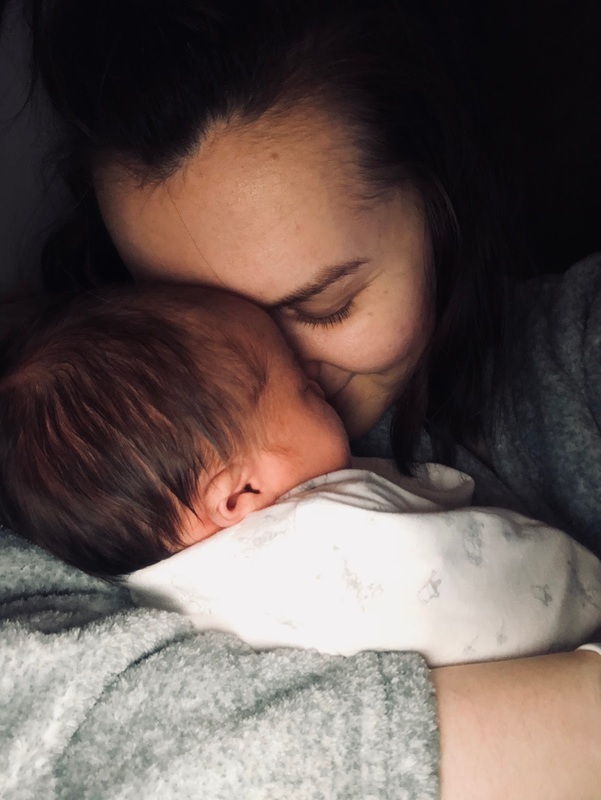 For my own piece of mind, I really believed that a C-section would be the best thing for me and my hidden anxieties, and it turns out that I was right. Once it was agreed that a section would be best, I was quickly given a pre-assessment appointment date, as well as the date that my baby would be born on. I was so excited, albeit very nervous too because, although I had asked for this type of birth, it is still major surgery, and it wasn't a decision that I had come to lightly. We had to be at the hospital before 10:30am on Monday 19th March 2018. I was not allowed to eat anything after 6am, which was a killer and I was to remain nil-by-mouth after 10am. I didn't actually go into theatre until approx 3:30pm, so I was starving and nervous, which isn't the best of combinations! Looking good in my gown and stockings! Eventually, my name was finally called. I was going to meet my baby. Max was with me the whole day, but at this point, he was not allowed to come with me. I had to walk myself into theatre, where the anaesthetist was waiting for me. Whilst this was all going on, Max had gone off to put his scrubs on ready to come and join me. Walking into theatre was one of the most surreal and scariest experiences that I'd faced so far. There's something unnerving about walking into somewhere where you're voluntarily allowing someone to effectively cut you open. I sat myself down on the operating table, where my cannula was inserted into my hand, and I was hooked up to drips and antibiotics. Once that was done, the anaesthetist began preparing my back for my spinal. Once that was in, I was told that my feet would start to feel hot with pins and needles rising up my legs. Sure enough, that happened and I was becoming numb from my ribs downwards. I was flipped onto my back, and was then waiting for Max to join me by my head. Things progressed pretty quickly at this point, as they started the first incision at 3:47pm and by 3:51pm, Edith Romy Jane joined the world. To put it bluntly, Edith became distressed very quickly once the spinal had gone in and her happy heart-rate had reduced greatly. So, the team working on me got her out as quickly as they could, with a specialist baby doctor waiting outside of theatre for my baby. I was so scared. Thoughts were floating in my head that I may not get the happy ending I wanted to desperately. However, once the doctor had attended her, we heard an almighty scream coming from outside. That was surreal. It was our baby. We didn't get to see Edie, until after she'd been checked. She wasn't lifted over the curtain for us to see her, and we had to wait several minutes for her to be given the all clear, but when she was, Max was taken over to her to cut her cord down. After the team had finished stitching me back together (the longest part of the procedure), I was taken into recovery, where Max and Edith were waiting for me. I was so excited to finally hold Edith, but I also felt dreadful. Once the surgery is over, you are taken to recovery for about an hour, to be monitored. Whilst this was happening though, I was enjoying my first lot of Edie cuddles and I got to do some skin-to-skin with her, as well as trying out breastfeeding for the first time. I felt so empowered at this point. I'd undergone major abdominal surgery, I was holding my baby, and I was being cuddled by my husband. It was euphoric. Things, again, took a turn for the worst. I began feeling very faint and unwell and Max grabbed the recovery doctors. My blood pressure had plummeted. We now know that this was because I'd haemorrhaged during my surgery. At the time, I didn't know this and I'm glad I didn't because I probably would have been more distressed. 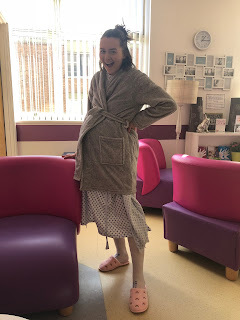 Once I started to stabilise again, I was moved onto the ward that I stayed on for two nights. I ended up going downhill again, once some of our visitors arrived, and I was passing out in the bed and was also losing a lot of blood. The midwives became concerned for me and were heavily monitoring me to see if my blood pressure went back up again. It did, and I'm fine now, especially with the help of the iron tablets I was given and all of the pain relief that I was sent home with. Now, although parts of my experience were scary, I would, without a doubt, go through it all again for Edith. I am so grateful that she is finally here with us, and we can begin our life as a family of three (plus three cats!). Beautiful, thankyou for sharing. Our little girl, also called Edith, was born by emergency cesarian and was also whisked out of sight immediately. Those confusing surreal moments where you don't know what's going on seem like forever but that moment you hear her cry stays with you forever - your baby is real and is here, right now. Very glad you're ok now. Wow, what an experience! But you got a beautiful baby out of it :) I felt a little bad for giggling when you mentioned her almighty scream. You'd just gone through all of that and her first reaction was to be upset at being taken out of her warm spot!